Long before European settlers came to America, Aboriginal peoples had developed communication systems that did not require writing or printing as was used in Europe or Asia. While it is generally acknowledged that Amerindians historically accessed their past primarily through oral traditions, we also know that they used physical means of communication for various purposes: for example, to communicate information; convey knowledge; commemorate events; identify certain titles, social positions and family ties; remember concepts, chants and ceremonies; and to situate past events in time and space. Various modes of cultural transmission used drawings and symbols to express an idea or share information. Pictograms (stylized drawings used as symbols) were painted, drawn, traced, sculpted or woven using different materials. Themes often dealing with hunting, war and the supernatural world were represented in combinations of different colours, sizes and arrangements. Written by a French Jesuit in 1666, “Mémoire au sujet des neuf familles qui composent la nation iroquoise [memoir of the nine families making up the Iroquois nation] (French only) includes drawings and explanations revealing how the Iroquois used pictograms to communicate information about family clans, military expeditions under way, the number of injured, etc. These Aboriginal communication systems are found on bark rolls, animal skins, totem poles and rock faces (the images are known as petroglyphs). We also know that the Iroquois used—and still use today—special ceremonial canes covered in motifs representing the 50 chiefs of the Haudenosaunee Confederation, and that Amerindians sometimes made marks in sticks of different sizes to remember what they needed to discuss at meetings. They would also make notches in trees to indicate, for example, details of their travels through the land. Because signs and symbols were used primarily as memory aids to illustrate concepts, they do not refer to specific words in spoken language; therefore they cannot be read in the same way as one would read a text. As valid and reliable as the written word, these mnemonic devices have the advantage of communicating information between people who speak different languages. Anyone able to recognize and decode the icons and symbols can decipher and understand the message, much like road signs today. 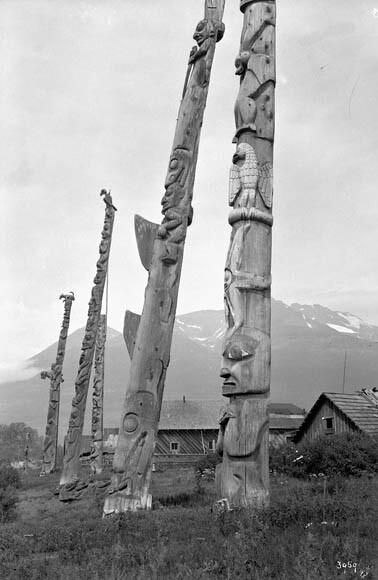 This entry was posted in Indigenous Resources and tagged Aboriginal, communication, oral tradition, pictograms, symbols, totem poles by Library and Archives Canada Blog. Bookmark the permalink.